Welcome to USGBC Florida's Blog! Access articles and opinion pieces written and published with our members in mind. Please be sure to subscribe to the Blog's RSS feed for post notifications delivered to your email address. Lastly, we want this Blog to be useful, thoughtful, measured, factual (unless noted as an opinion piece) and be a resource for people to learn from local experts. To help us get there, please review our Simple Blog Rules. Submissions for consideration of posting should be sent to info@usgbcflorida.org. for Health," exploring the various impacts the built environment has on human health. Explore topics related to health in the built environment. practitioners to discuss how to design, build, and operate healthier buildings. Source above: ACEEE 2017 State Energy Efficiency Scorecard, pg. 26. Lately, it seems we are deluged with bad news about climate change and the rate at which the Earth is warming. Science tells us that humans are accelerating the process, and observed changes ranging from lower snow totals, glacial melt, increased extreme weather events, wildfires, drought, and rising sea level show how climate change poses risks to the communities and places we care about. These predictions threaten our lives and way of life made real most recently by the three hurricanes that devastated areas of the U.S. and its territories this fall. While it’s hard to pinpoint the effect of climate warming on any specific weather event, scientists believe storms and flooding will be more extreme and frequent. For some, climate change may seem overwhelming and detached from everyday life. For others, the prospect of taking action comes with worry; what will these changes mean for me and my business? How can I act without hurting my livelihood or my family’s quality of life? The reality is that we have solutions — and increasingly, they save money and deliver valuable co-benefits. Solutions are the focus of the 23rd annual Conference of the Parties to the UN Framework Convention on Climate Change (COP 23), taking place in November in Bonn, Germany. COP 23 marks the second meeting since the conference achieved the first-ever global consensus for climate action through the Paris Agreement, which remains a groundbreaking accomplishment. With Paris, 180 countries acknowledged that humans are a cause of climate change and that collective action should be undertaken to keep the planet’s warming to well below 2 degrees Celsius. This will also be the first COP since the United States government announced its intent to withdraw from the agreement. There is tangible evidence of this: There will be no U.S. Center at the Conference for our country’s scientists, engineers, businesses, and policy makers to share knowledge and exhibit leadership. The U.S. government will be present at a reduced capacity, and its influence in the agreement is uncertain. What’s exciting is that across the U.S., governors, mayors, and business leaders are working hard to fill this void and demonstrate progress. More than 2,300 leaders from cities, states, businesses, and universities, representing more than 127 million Americans and $6.2 trillion of the U.S. economy, have signed the We Are Still In statement, pledging to “pursue ambitious climate goals, working together to take forceful action and to ensure that the U.S. remains a global leader in reducing emissions.” Adding to this, a bipartisan coalition of 15 states and territories, representing 40 percent of the U.S. GDP, have joined together in the U.S. Climate Alliance, pledging to meet their share of the Paris Agreement. Significantly, they are investing and adopting policies to realize these pledges, from building codes to renewable portfolio standards. The U.S. Green Building Council (USGBC) is participating in the U.S. Climate Action Pavilion — sponsored by the We Are Still In coalition — where state, city, and private sector entities will affirm their commitment and share specific actions to accelerate the U.S. low carbon economy. Engaging in side events, representing our members and our mission, and collaborating with partners, USGBC’s goals at COP 23 are to advance solutions, and to reassure the party-nations that U.S. businesses, states, cities, and individuals remain dedicated to doing our part. Now is a great time to consider the ways you can contribute to the collective climate action effort. Consider the menu of options below to help support a local, regional, and global transition to a low carbon society. The starting point for improvement is understanding where you are. Measuring the carbon contribution of your project, building, product, or portfolio is a crucial exercise. For operations, tools like Arc and ENERGY STAR can help benchmark performance and prioritize improvement. For projects, in addition to energy-carbon modeling, whole building or product life cycle analysis for carbon is an underutilized opportunity to support decision making, and tools are increasingly available. If a comprehensive analysis is out of reach, consider what you can. This exercise alone can identify opportunities to reduce impact, such as selecting local materials that avoid carbon-intensive transportation or selecting products that sequester carbon. For building-scale projects, the Carbon Leadership Forum offers resources on life-cycle carbon assessment; for operations-scale, the Carbon Disclosure Project has guidance on measuring and disclosing emissions of portfolios. Make a company commitment to climate action or adopting carbon emission reduction targets. According to We Are Still In, nearly half of the U.S.’s largest companies have at least one climate or clean energy target. Interest in climate commitments has risen in the building sector too. For example, many diverse companies have joined the Building and Real Estate Climate Declaration that USGBC initiated with Ceres and the Carbon Leadership Forum. With the Paris Agreement in force, commitment platforms are gaining steam and specificity. The Climate Group’s RE100, under which companies commit to 100 percent renewable energy, is attracting businesses from all sectors including tech, finance, and investors. EP100 is a similar initiative seeking commitments to doubling energy productivity. For those in the design field, consider the AIA 2030 Commitment or the Structural Engineers 2050 commitment. The nonprofit Science Based Targets also supports companies in setting greenhouse gas emission reduction targets in line with climate science. The concept is simple: Less consumption reduces your carbon footprint. Look at ways to use space effectively. “Use less” extends to land as well: Think about core strategies of infill and densification over greenfields. Can you say Yes in My Backyard (YIMBY)? Resources are available from organizations such as Congress for the New Urbanism and the American Planning Association. The corollary to using less is that reuse at all scales is beneficial. Put this into action by working with an existing building, rather than tear-down or new construction. Some estimate embodied carbon savings of 50 to 75 percent by renovating rather than building new. Reuse, and use recycled materials and products where possible, to avoid the energy consumption required to create new materials and those associated with transport and disposal of discarded materials. New construction and major rehabilitation can achieve deep energy efficiency and may have the opportunity to become net-zero carbon or close to it. New Buildings Institute, Rocky Mountain Institute, and USGBC offer lots of resources to help you get there. Key steps include reducing load and demand; meeting loads efficiently; and producing renewable energy on site. Explore the options to reduce carbon impact from your project and look beyond energy in operations. Examples include enhanced refrigerant management and measures that directly reduce the use of potable water, nonpotable water, or raw materials. Carbon, that is. There are now more ways than ever before for your project to provide long-term carbon storage. Consider the many Greenbuild exhibitors that bind carbon, such as cement substitutes and siding. Check out the Greenbuild Expo floor, showcasing more of these innovations each year. Beyond the building wall, managing the site and landscape can also help. Avoiding soil and tree loss and disturbance helps reduce carbon release to the atmosphere; green roofs, new trees, and living walls can mitigate urban heat islands, thus reducing building cooling needs, and potentially sequestering carbon. Pay attention to how your project or building influences choices for food and transportation. 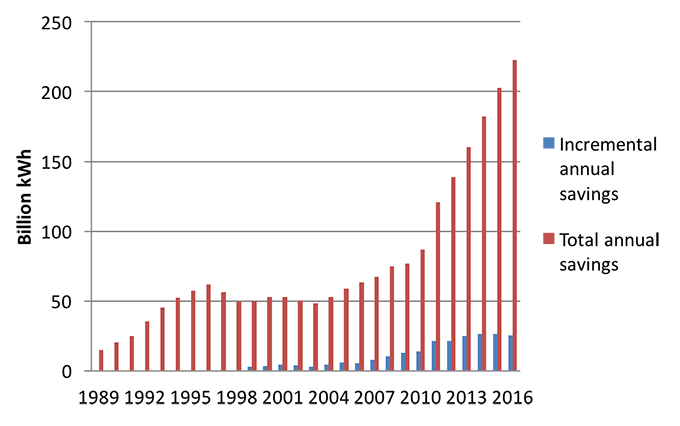 Those non–energy categories really do influence the total carbon impact of a building on the community. Stopping food waste in the U.S. could become a significant solution, cutting carbon emissions associated with food production, distribution, and waste disposal. According to National Geographic, if food waste were a country, it would be the world’s third largest emitter of greenhouse gases. Leading cities are starting to offer municipal food composting, and private companies are starting to serve restaurants and commercial entities — leading to benefits like new jobs and industries, and developing high-quality fertilizer. You can design your spaces to make food composting easier, purchase locally produced crops, and adopt responsible policies for catering. Check out TRUE Zero Waste certification to get started. Transportation is also a key factor. In the U.S., reducing carbon emissions from transportation remains a big challenge. In Massachusetts, for example, after implementing policies over the past decade to drive aggressive energy efficiency and renewable energy uptake, the state now identifies transportation as its biggest hurdle to decarbonizing. USGBC has long recognized the role buildings can play in influencing employee transportation. Siting decisions are important, and company support for alternative transportation can help sway employee choices. Building managers and companies can support availability and convenience for alternatives—with electrical vehicles charging in parking facilities, secure bike storage and showers, shuttles to mass transportation, and public transit subsidies. Your project, building, or company can have a big influence on employees and the supply chain. Start a conversation with your peers, suppliers, and customers. Understand where they stand on climate mitigation and find areas of mutual interest and opportunity. Learn what your city is doing and support climate-smart policies. Many climate-aiding strategies have big co-benefits—for local economies, water resources, public health, occupant comfort, and saving money. Find those touchpoints that resonate, and hone your elevator speech on what you’re doing and why. For tips, see EcoAmerica’s guide to effective climate change communication. Challenge yourself to learn something new through a course, podcast, or book. Renew your arsenal of strategies. Talk to others and see the issue through their eyes; it is sure to make you think. Ask them to join you in taking one step toward climate mitigation, whether personally or as a company. Above all, do something. Make it personal, because ultimately it is. You are part of the solution. Going green on a budget: Can every homeowner reduce their carbon footprint? By Preston Guyton, Realtor/Broker in Charge/Managing Partner, CRG Companies, Inc. Going green, and being true to your environmental consciousness doesn't necessarily involve spending a lot to revamp or improve your home environment. Rather, lifestyle changes and simple home enhancements can be the initial building blocks that lead to a reduction in carbon footprint. On a global scale, sharing a commitment to reduce waste, recycling when possible and moving towards sustainable living is demonstrably effective—perhaps even more so than government mandates and public initiatives. Nearly every homeowner is concerned with saving energy, if only from a financial perspective, and most are also aware of water issues and the need to conserve and protect fresh water supplies. Green building principles have become mainstream, and homes built today are much more energy-efficient and environmentally friendly than homes built even a decade ago. They are also safer and "healthier" for their inhabitants; leading to more comfortable living. For the most part, toxic substances once used by builders have been eliminated in an effort to protect both human life and the environment, and use of renewable and locally-sourced materials is common. If you're looking at new homes, insist that the builder subscribe to green building principles. Perform an informal energy audit of your home environment. Be aware of drafts: check seals, weatherstripping and caulking around all exterior openings. Check attics and basements if your home has them. Use air conditioning and heating only as necessary. Invest in technology: Automated thermostats that allow you to control your home's temperature settings remotely via smartphone are relatively inexpensive, but very effective. At the very least, replace old thermostats with programmable models—and use them! You'll save money as well as energy. Be aware of your water usage. If you have water-guzzling toilets and faucets, replace them. Always fix leaks and drips, not only for water savings, but to prevent future problems. Water lawns and gardens only as necessary, or investigate water-saving drip irrigation and add timers to your sprinklers. Modernize your lighting. If you haven't done it yet, replace older lighting fixtures and bulbs with more modern, more efficient, low-energy models. You'll not only reduce energy consumption, but you'll gain new style and convenience. If you're still using incandescent bulbs, look for newer, cooler options. Unplug small appliances when they're not in use and ask your utility companies about the benefits of off-peak usage hours. Investigate solar energy. You don't always have to install solar panels on your roof to reap the benefits. Walk more; drive less. Use public transportation, or investigate carpooling. Reduce your use of paper and packaging. Go wireless for bill-paying and communication, even for reading the latest novels. Invest in reusable grocery and shopping bags. Buy fresh produce at farmers' markets rather than packaged or canned vegetables, or start a backyard garden and buy some of your own. Cook meals at home. Pack a lunch rather than ordering packaged food items at convenience stores and drive-through restaurants. Make a habit of reusable, refillable water bottles and coffee mugs, and frequent green businesses: Dry cleaners, hotels, and restaurants are commonly green; support organizations in your community that raise awareness and promote education. Adopt a minimalist attitude and lifestyle to the degree it suits you. Recycle, reuse, repurpose. If you start a compost pile and take a cooking class to boost your knowledge of health and nutrition and to learn how easy it can be to cook meals at home from fresh ingredients, the reduced packaging and waste will save money. There is a meme circulating on social media that claims "Grandma was Green." In some important ways, it seems modern society has a lot to learn from the past in terms of easy, natural and beneficial solutions. There are "green" options for cleaning products, pest control, healthful living and home comfort, even for clothing and everyday leisure pursuits. It might just be that by looking to the past for inspiration, modern families will find that reducing their carbon footprint is not at all difficult; it just takes a bit of thought. Are More Intense Storms the New Normal? Climate change and sea level rise are topics upon which I have frequently written/blogged. As my neighbors and I in South Florida continue to recover from Hurricane Irma, Texans from Hurricane Harvey, and our fellow citizens in Puerto Rico from Hurricane Maria, the experts are already running out of adjectives to describe these storms. Harvey has been described by the National Weather Service as “unprecedented” and “beyond anything experienced”, and Irma was the largest ever-recorded Atlantic hurricane and set some impressive records: it remained a Category 5 (the strongest category) for more than three days, the longest duration for a Cat 5 in more than 50 years; Irma maintained a maximum sustained wind speed of 185 miles per hour for 37 hours, the longest of any cyclone ever recorded anywhere on earth; it generated the most accumulated cyclonic energy of any recorded Atlantic storm; and, it alone generated more accumulated cyclone energy than 18 of the 51 full hurricane seasons since 1966, thus meeting NOAA’s definition of an average full Atlantic hurricane season (June through November) in one storm! The role of climate change in these events is, of course, being widely discussed, and the scientific evidence of rising global temperatures is undeniable. The only question, hotly debated by politicians, is the impact of human activity to the phenomena. There can be no argument that sea levels are rising, and warmer ocean temperatures have certainly contributed to that rise. For example, according to Michael Mann, distinguished professor of atmospheric science at Penn State, there is a simple thermodynamic relationship that demonstrates a 3 percent increase in average atmospheric moisture content for each nearly 1 deg. F. (0.5 deg. C.) of temperature rise. Based on the increase in the Gulf’s surface temperatures from approximately 86 deg. F. to 87 deg. F. (30 deg. C. to 30.5 deg. C.), there was at least 3 percent more moisture in the atmosphere, a fact that clearly contributed to Harvey’s record breaking rainfall. That, coupled with the > 6-in. (15 cm) higher sea level, made the storm surge from Harvey, and resulting destruction, even more deadly. The storm surge in the lower Florida Keys from Hurricane Irma was also devastating. I have witnessed first-hand that destruction, since a friend had (and I literally mean “had”) a home in Big Pine Key, where Irma’s eyewall made landfall. Climate scientists cite several anthropogenic activities as having contributed to the increase in local sea surface temperatures, including human-induced emissions of greenhouse gases and particulate pollution. In addition to the higher water temperatures, experts point to the coastal subsidence caused by human activities such as oil drilling, as contributing to the rise in sea level. According to Kevin Trenberth, with the Climate Analysis Section at the US National Center for Atmospheric Research, human impact could be responsible for as much as 30 percent of Hurricane Harvey’s rainfall. There is no doubt that Irma’s strength was directly linked to the warm water temperatures resulting from climate change. Fortunately, here in Florida our building code was substantially revised after Hurricane Andrew, 25 years ago last August. It is almost certain that many areas are faced with the prospect of more intense storms occurring more frequently – Harvey caused the third “500-year” flood in three years (some meteorologists are calling it a “1000-year” event), the other two being the Memorial Day floods in 2015 and 2016 – and Houston had major flooding on an average of four-to-five days each year from 1996 to 2015. So, it may be time for other hurricane-vulnerable coastal states to review their building codes and to consider green building standards and rating systems, such as LEED. Although LEED does not require climate change adaptation strategies – as opposed to mitigation strategies that are required – it does suggest the implementation of design, construction, and operational strategies that may help increase a building’s resilience to a hurricane or other climate-related event. In some cases, such as the EA Prerequisite: Education of Homeowner, Tenant, Or Building Manager in LEED for Homes, the content could include education on areas of refuge within the building. USGBC also has a Climate Resilience Screening Tool that may be helpful in determining appropriate strategies. Also, Property Assessed Clean Energy (PACE), about which I frequently write and lecture, considers hurricane hardening (roofs, impact-resistant doors and windows, etc.) as qualifying improvements here in Florida. This is also something that other localities may wish to consider, since PACE is already contributing to the restoration efforts here in Florida. In so many parts of our country and the world, people are facing devastations from catastrophic weather and geological phenomena of a scope and scale that I cannot even begin to imagine. USGBC is a global community and watching those suffering from Hurricanes Harvey and Irma, wildfires in Oregon, the earthquake in Mexico and the new storms and hurricanes making their way through the Caribbean at this very moment has been heart-wrenching and a painful reminder that we are all vulnerable to natural disasters. My prayers are with those who are suffering, have lost loved ones, and must truly rebuild their lives and communities. USGBC stands with these communities as they begin the long, hard work of recovering from the effects of these natural disasters. It will take many years for our coastal cities and those inland to return to a sense of peace and prosperity. USGBC, as an organization and as a community, will remain attentive to the needs of residents, students, city leaders and state officials for the duration of the recovery and renewal effort. We are All In and stand ready to help. Each of us has a unique leadership platform -- a set of values and beliefs for which we stand. Our platform may be known to others, or it may just be a quiet presence that guides our daily lives. One of the things I’ve always thought of as the definition of a leader is someone who inspires purpose and progress, but more importantly someone who uses their leadership platform to make things better. By that definition, every single member of the USGBC community is a leader. USGBC and its 12,000 member companies, the more than 20 billion square feet of LEED projects, the hundreds of committee and community members, the amazing volunteers in Communities and Chapters like USGBC Florida, the 201,000 LEED APs, and the 25,000 Greenbuild attendees are all inspiring purpose and progress and making things better. Whether it’s creating a new and innovative fixture that saves water, developing alternative materials that are healthier for people, identifying a new strategy designed to reduce cooling costs, or helping to educate the future green building industry -- we are ALL making things better. Having been with USGBC for more than 15 years, I have seen the rise of green building up close. More than 20 years ago, USGBC started as a vision, and today it is an unparalleled global brand of sustainability responsible for anchoring one of the most important environmental movements of our time. I have first-hand knowledge of the leadership that makes up our community. I have seen the committed volunteers who come to Greenbuild every year and dive right in to make the show a success. I have seen the amazing committee members who have so much knowledge and information, dedicating hours of their time every week to committee meetings to make LEED the best green building program in the world. I have seen the newly integrated USGBC Communities and other USGBC Chapters whose leaders have worked so hard to unite and to speak with one voice, leading the movement nationwide! I have seen the LEED APs and LEED Green Associates from all over the world who have studied so hard to pass their exams so that they could be a part of the story. They are all true leaders and they are all part of the USGBC leadership platform. Leave the world a better place by reducing the environmental impact of our buildings, homes and communities. Make the benefits of green building accessible and available to as many people as possible. Foster an environmentally and socially responsible, healthy, and prosperous world that improves the quality of life for everyone. This leadership platform guides us in our everyday activities at USGBC. Everything we do is looked at through this lens. We also need the right tools and platforms in place to succeed. That’s why I’m looking forward to this year’s Greenbuild conference in Boston, which also happens to be one of USGBC’s largest platforms. Greenbuild Boston (November 8-10) will have an amazing line up of educational sessions on LEED v4, materials, human health and water issues, to name a few. We are also deep in the thick of planning USGBC’s signature events: Waterbuild, the International Summit, the Communities & Affordable Homes Summit , the Women in Green Power Breakfast (which I am hosting this year!) and the Executive and Leadership luncheons. You want to see innovation? Experience leadership in action? Execute on your leadership platform? Then I look forward to seeing you at Greenbuild Boston this November! 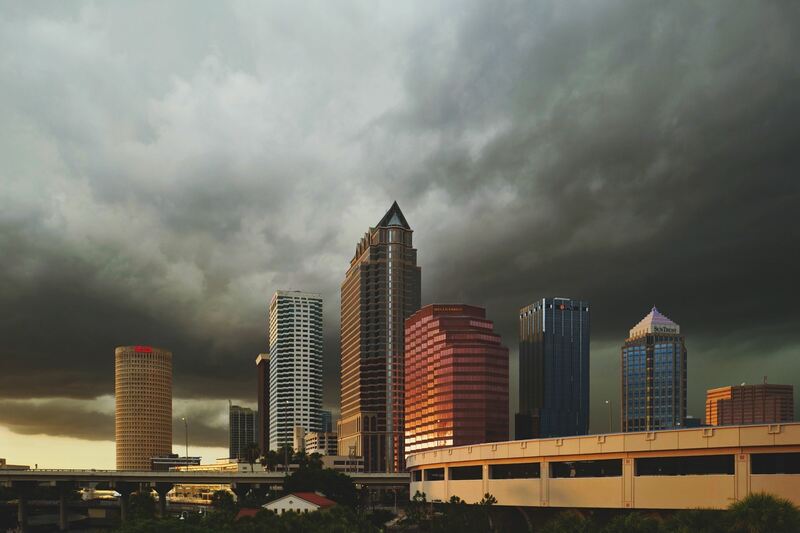 Cities and counties across Florida have continued to embrace Property Assessed Clean Energy, or PACE, financing as way to encourage energy efficiency, clean energy and wind resistance upgrades in the residential and commercial building sectors. PACE is an innovative form of financing that allows property owners to finance green building improvements and pay for them over time through their property tax bill. It’s a public-private partnership model that the State of Florida has moved to embrace. Point-of-sale financing: PACE is offered when homeowners are already working with contractors to replace failing or broken systems, or if they are already in the market for green building or resiliency improvements. Approval is often quick, unlike some clunkier government programs. Expanded access: PACE is a financing option that is based on the equity in a home and a record of on-time mortgage and tax payments, among other underwriting criteria. It improves home improvement: PACE providers brought a public-private partnership -- and its built-in accountability requirements -- to a sometimes-messy home improvement marketplace. Through voluntary actions and state requirements, PACE is bringing a new level of oversight and best practices to the way homeowners interact and resolve disputes with contractors. There’s still work to be done, but leaders from Tallahassee to Sacramento to Washington are working with PACE providers to improve the overall PACE consumer-protection framework. These developments are all exciting ones for Florida, where multiple large population centers have moved or are moving to make PACE available. Leon, Palm Beach, Collier and Hillsborough Counties will welcome their first programs this summer, and Pinellas, Sarasota and Manatee are moving quickly to follow suit. Orlando, Miami-Dade and Broward have been in the PACE game for years, which makes sense given their commitments to sustainability and, for South Florida, the need to give homeowners a mix of tools to improve their homes’ hurricane resiliency. The PACE embrace also comes at a time when residential solar finally has the runway and policy environment needed to take off. In June, Governor Scott signed a bill to implement pro-solar Amendment 4, which voters overwhelmingly approved at the ballot box last November. Finally, the Florida PACE marketplace is growing more competitive. This month, the country’s largest PACE provider, Renovate America, will enter the Florida market, joining five other growing, active players: Florida PACE Funding Agency, Renew Financial, Ygrene, SELF, and Leon County Commercial PACE Program. By nature, this competition fosters higher standards, lower interest rates and more options -- all good things for homeowners. USGBC has long supported PACE programs and this momentum, and Florida’s leadership is something to celebrate. From efficient HVAC systems, windows and water heaters, to wind-resistant roofing and residential solar, PACE is an increasingly popular option for homeowners, contractors and local governments. It is surpassing expectations and we hope to see the industry boost clean energy job creation, emissions reductions, and energy bill savings across the state in 2017 and beyond. Jacksonville, FL (July 17, 2017) The U.S. Green Building Council Florida (USGBC Florida), Eco Relics and Norsk Tiny Houses are partnering to build the first Leadership in Energy and Environmental Design (LEED) certified tiny home in the U.S. (and maybe the world) by November 2017. To launch this unique effort, the partners are inviting the community to participate in a free and open-to-the-public charrette and help them make history by creating an amazing sustainable tiny house with creative ideas from northeast Florida and beyond. The charrette is on Friday, July 21, 2017, 9am to 5pm, at the LEED Gold Jessie Ball duPont Center, 40 E. Adams Street, Jacksonville, FL 32202. Anyone can attend -- all day or for part of the event -- in person or beam in from outside the area via GoToWebinar by simply registering at www.usgbcflorida.org/calendar. Goals for this ambitious project include: 1) Education -- Create an inspiring project that educates the masses about making a home healthy, high performing, environmentally sustainable and LEED Certified (think 24/7 webcam, open meetings to learn the process, high school and university students helping with ideas and research, road tour ending up at Greenbuild Chicago 2018 ... and more! ); 2) Repurposed Material -- Our tiny home will be built from as much reclaimed, recycled and repurposed materials as possible thanks to Eco Relics' remarkable warehouse; 3) Project Experience -- Provide actual LEED project experience to many so they can learn on a live venture; and 4) Inspirational Journey -- Inspire LEED tiny house communities and people to live tinier, easier, meaningful and sustainable lives. Construction and a kick-off event will occur in August 2017 at the Eco Relics location. There will speakers from Eco Relics, USGBC and members of the project committee, as well as sponsors on site. The entire project will be documented through a 24/7 webcam, pictures, video, blog posts and various social media platforms. After the completion of construction, the Tiny House and crew members will be attending the 2017 Florida Tiny House Festival in St. Augustine, Florida, before embarking on a one-year educational tour throughout Florida and ending at the Greenbuild conference in Chicago in late 2018. 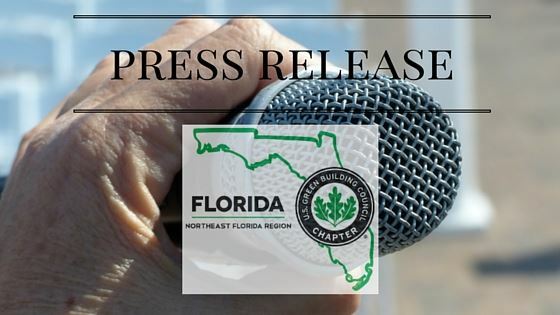 USGBC Northeast Florida’s 20.40 Talks in the News! USGBC Northeast Florida captured local media’s attention with the hot topic of sea level rise and resiliency at USGBC Northeast Region's 20.40 Talks event held on June 29. Speakers included Mayor Nancy Shaver (City of St. Augustine); Margo Moehring, AICP, Managing Director of Policy and Planning, Northeast Florida Regional Council; and Kathryn Frank, Assistant Professor, Department of Urban and Regional Planning, University of Florida, College of Design, Construction & Planning. The topic was timely and extremely relevant, as each speaker discussed how Northeast Florida may directly be affected by sea level rise. Local news media and public officials from various agencies were in attendance, and the event drew more than 70 registrants. The program was held in the Jesse Ball DuPont Center, a building that is tracking LEED Gold Certification and which achieved an EnergyStar score of 99! 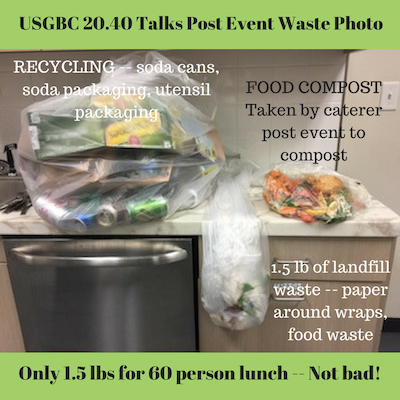 Another interesting tidbit about the event was the zero-to-low waste goal. Real dinnerware including glassware and silverware were used instead of disposable. The local caterer, Super Food & Brew, also composted all our food waste post event with Apple Rabbit. And a student volunteer was onsite and assisted attendees with separating recycling and compost. Special thanks to USGBC NE FL 20.40 Talks Chair, David Garcia, for organizing this eye-opening program, and kudos and thanks also are extended to 20.40 Talks team members/event volunteers Kim Jowers, Carol Miller, Andrea Conover, Geoff Selhorst and Kensey Selhorst, as well as to Sarah Boren, USGBC Florida's Director of Policy and Programs.